Take more actions and increase your chances of winning! Over the last years, Radial pedals become more and more popular with some of the world´s best session musicians like Tim Pierce, Zac Rae, Dan Rothchild and others. Why? – Simple answer: Because of their amazing sound quality! 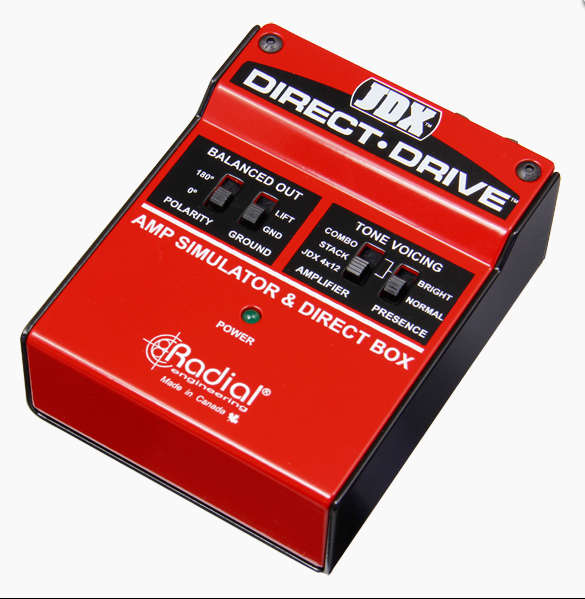 The JDX Direct-Drive: Amp Simulator and DI Box. I´ve tested this thing at AES 2016 this year and I absolutely love it! The JDX Direct-Drive is a purely analogue guitar amp simulator and DI. By using it, you´ll be able hook up your DI directly to the PA and get a beautiful amp tone, without using an actual amp! – In other words, with the Direct-Drive on your pedalboard, you can do a gig without carrying an amp to the club. Shure SM57™ in front of a Marshall™ 4×12 cabinet. The amp tones can be further tailored using a presence switch for extra sparkle. You have the chance to win the JDX Direct-Drive today! Sign up for the giveaway by taking the suggested actions above. Remember: The more actions you take, the more likely you´ll be to win.